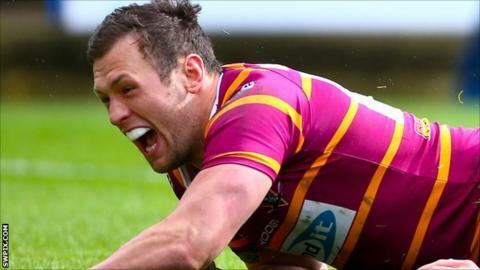 Huddersfield Giants secured back-to-back victories in Super League for the first time this season with success against Wakefield Trinity Wildcats. Giants led at the break with tries from Jodie Broughton, Michael Lawrence, Ukuma Ta'ai and Leroy Cudjoe, while Jarod Sammut and Lucas Walshaw replied. Jason Chan and Shaun Lunt made sure of the points after half-time as Danny Brough kicked all six tries. Jon Molloy crossed for Wakefield, who have now lost their last six games. The hosts, who recorded a 42-22 Good Friday win at Salford, started strong, with prop Eorl Crabtree and winger Aaron Murphy making clean breaks inside the first four minutes. That pressure told when Leroy Cudjoe gathered a Michael Lawrence kick to put winger Jodie Broughton over at the corner. Lawrence then crossed himself, taking Shaun Lunt's pass close to the line, but the Wildcats replied before the hooter through Sammut, who then put in a kick that Walshaw touched down. Errors proved costly for Wakefield as Giants pounced, first when centre Joe Wardle picked up Sammut's dropped pass to get forward Ukuma Ta'ai over and Cudjoe's intercept from Paul Sykes' loose ball was enough for them to lead 24-10 at the break. Jason Chan ripped through to extend the lead soon after half-time as Giants continued to dominate, but Jon Molloy went in to give Wakefield hope. However Shaun Lunt's late try sealed the win - Huddersfield's first at home this season. "The positive (thing) is, it's over. "It was a boring game, wasn't it? We were wishing our lives away at one point. There was fatigue but that's no excuse for the errors. We just weren't good and, if we don't step up in quality for our next game, we will get burned. "I don't want to sound disrespectful to Wakefield but we were within our rights to think we should have done better. "We didn't and that was partly down to Wakefield but also ourselves. Our attention was disgraceful at times." "It was a typical second game at Easter. It probably lacked intensity but we can take plenty of positives. "We worked hard and were enthusiastic and I thought we showed some real positivity with the ball in the first half but little errors are hurting us big time. "I understand why we're a bit disjointed but I'm hoping time on the training field before our next game will help us." Huddersfield Giants: Grix; Broughton, Cudjoe, Wardle, Murphy; Brough, Wood; Crabtree, Lunt, Kaufusi, Chan, Patrick, Lawrence. Replacements: Kopczak, Bailey, Ta'ai, Mullally. Wakefield: Sammut; Fox, Mathers, Walshaw, Riley; Sykes, Siejka; Raleigh, McShane, Scruton, Ryan, Washbrook, Smith. Replacements: Godinet, Anderson, Moore, Molloy.